He said the crowd had reached the Washington monument as he spoke at the US Capitol, despite photographic evidence to the contrary. On Saturday, millions in the US and around the world protested against Mr Trump’s new administration. The largest US rally was in the capital Washington, which city officials estimated to be more than 500,000-strong. 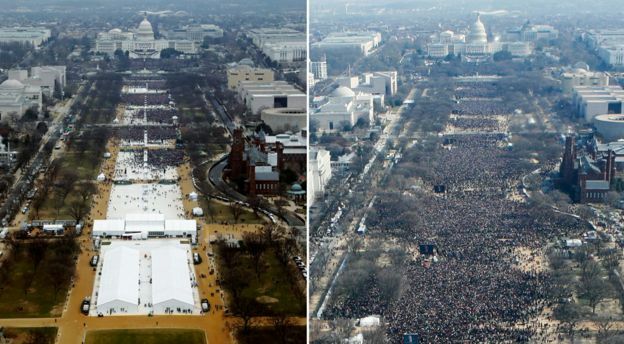 By most estimates, it surpassed the crowd at Friday’s inauguration. The aim was mainly to highlight women’s rights, which activists believe to be under threat from the new administration. Mr Trump did not mention the protests during a bridge-building visit to the CIA headquarters in Langley, Virginia, on Saturday but instead turned on the press. He accused the media of inventing a feud between him and the intelligence community and he called reporters “among the most dishonest human beings on earth”. Mr Trump said TV footage and photos of his inauguration had painted an inaccurate picture. He also said the crowd extended all the way back to the Washington Monument, although this claim is contradicted by aerial shots from the day. “This was the largest audience ever to witness an inauguration, period. Both in person and around the globe,” he said in a fiery statement.